At first glance, Kelly Akashi’s exhibit “&” is deceptively uninteresting. From the entrance of the gallery, one can see objects laid out on an unusually high table that is painted at the surface and three additional works; an object that resembles a mop on the left side wall, another that mimics a dreamcatcher hung on the far wall, and a glass sculpture on a pedestal that looks like a rock in a nook at the back of the gallery. This “deception” is in part caused by a pitfall that any artist faces when deciding to incorporate a material (in Akashi’s case, glass) with a rich history and tradition, specific to that medium. When craft and technique are specific to the material being used, it can overpower the whole sculpture and become ‘ordinary’ rather than a unique contemporary sculpture. 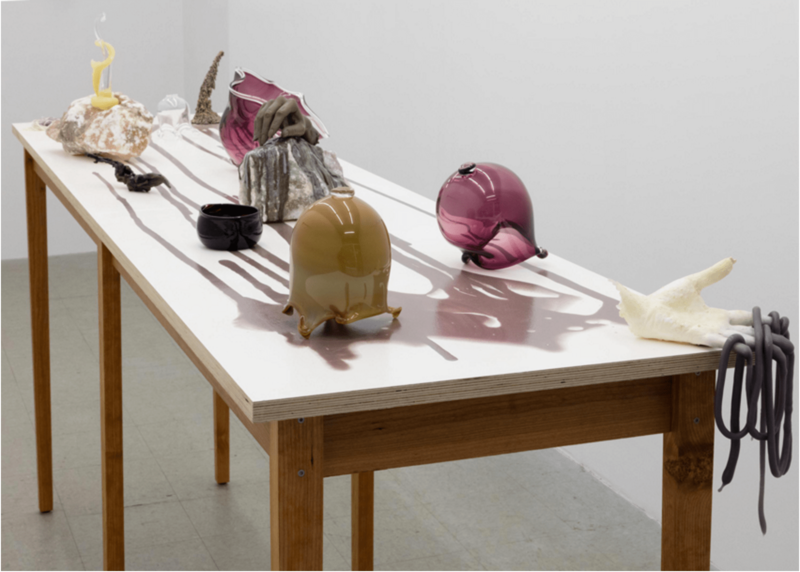 Even though there are a few objects in her sculptural installation, “Figure 14 or My Alphabet” (2014-2015), that are blown glass, Akashi is able to avoid the aforementioned pitfall through her clever juxtaposition of various materials, most notably by combining glass with wax and bronze. Her use of lead, fingernails, wax, cotton wick, alabaster, silver gelatin (photographic emulsion), and oil addtional materials in “&” initially seems haphazard, but expand upon an active dialogue where each object doesn’t necessarily stand alone but exists as part of a whole. 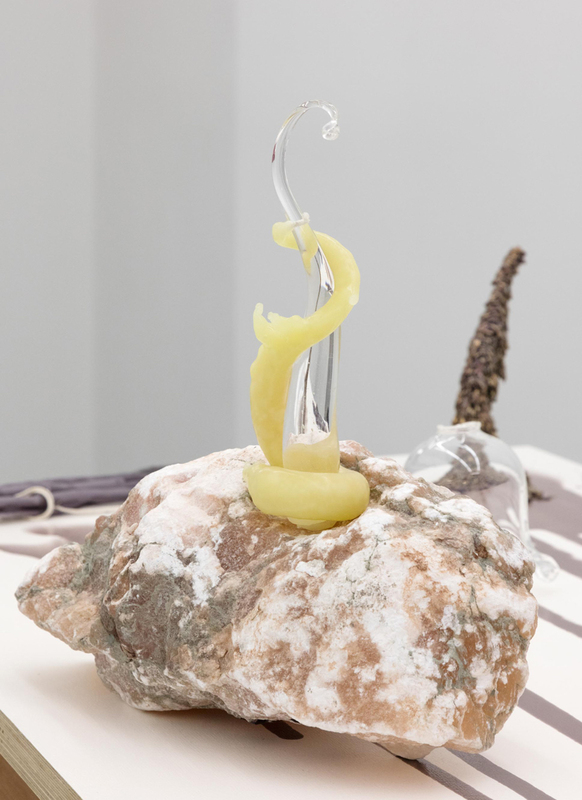 For example, there are two sculptures on the table made using rock, one where a piece of hand-pulled glass stems out from a rock and is wrapped in hand-pulled wax that resembles in both texture and form a tentacle, and the other where a bronze cast hand is sensually placed on top of a rock, bronze and silver gelatin poured on the rock’s surface. 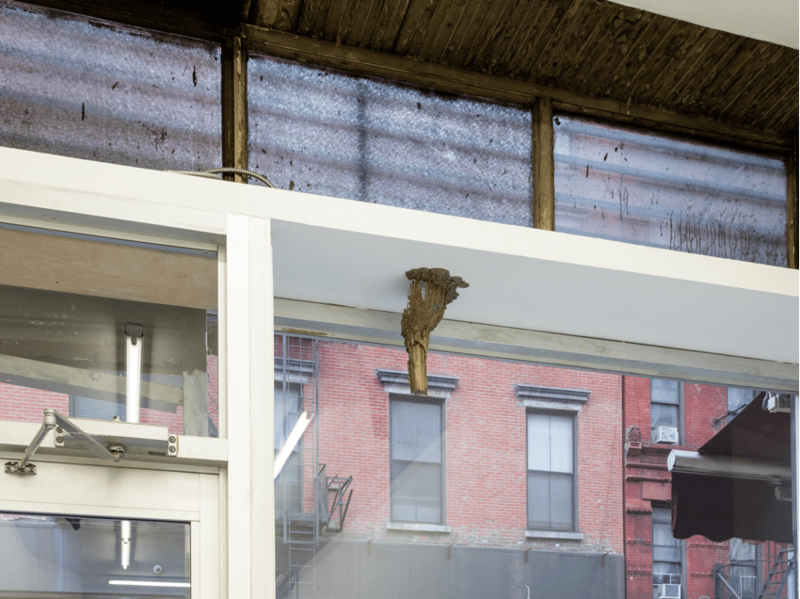 This piece draws a parallel to the work installed near the wall farthest from the entrance, Geode (2015), where a piece of bronze is embedded in glass. Due to the differing coefficient of expansion in these two materials while trapping the bronze in glass, cracks formed and are apparent. Each material is used to comment on its own unique quality and function in each of her sculptures, including but not limited to their malleability, fragility, and artificiality. By exploring contemporary objects and symbols through such charged materials like glass and wax, Akashi unexpectedly captivates the audience in the dialogue created by her works. 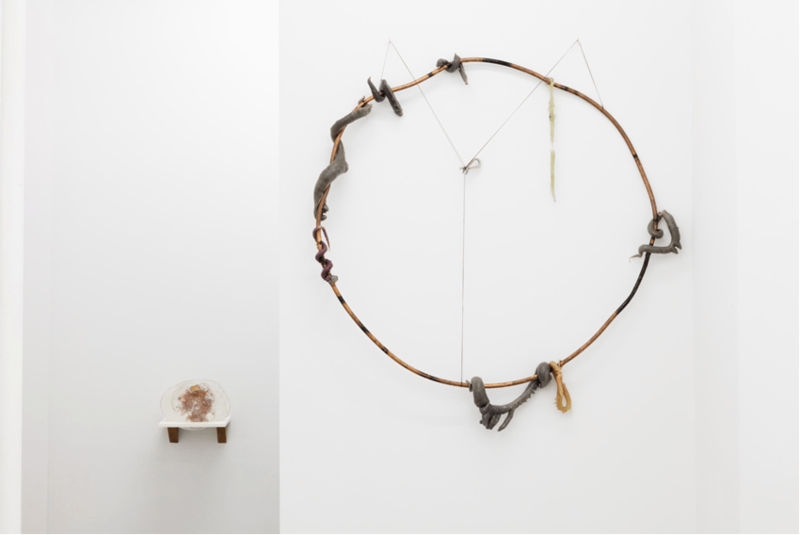 Kelly Akashi’s solo show “&” is on view at Tomorrow Gallery in the Lower East Side until January 10th, 2016. She is represented by both Michael Jon Gallery and François Ghebaly Gallery. Jongho Lee is an artist and student at New York University. He is currently working with ETTD as our Editorial Intern.